Upon completion, Chickahominy Falls will include a 10-acre working farm. Healthy living for active adults in the Greater Richmond area has arrived. Chickahominy Falls, an age-restricted community, recently opened with resounding success, selling 21 homes in one day, according to Builder. Although the great majority of the community is still under construction, the demand for immediately available homes was so overwhelming, the developers had to hold a drawing for potential buyers. Its farm-focused nature sets Chickahominy Falls apart from competing active-adult communities. In addition to many of the amenities normally found in age-restricted communities, Chickahominy Falls features Woodside Farms. Woodside Farms is a 10-acre working farm expected to produce a variety of edible green, such as collards and spinach as well as an assortment of wildflowers. Over 73 of Chickahominy Falls’ 180-acres will be set aside for the farm and outdoor amenities such as fishing ponds and walking trails. Chickahominy Falls is located in the Glen Allen, Virginia along the Chickahominy River and just outside of Richmond, Virginia. On completion, the community will consist of 400 homes, 300 of which will be single family homes. These homes will be separated into small neighborhoods connected to each other via walking trails. Chickahominy Falls’ wide range of amenities are focused on the outdoors. These amenities include a clubhouse, outdoor pool and patio, and an extensive network of walking trails. It is important to note the developer’s commitment to environmental preservation and sustainability practices that will preserve the surrounding tree life, watersheds, and river. 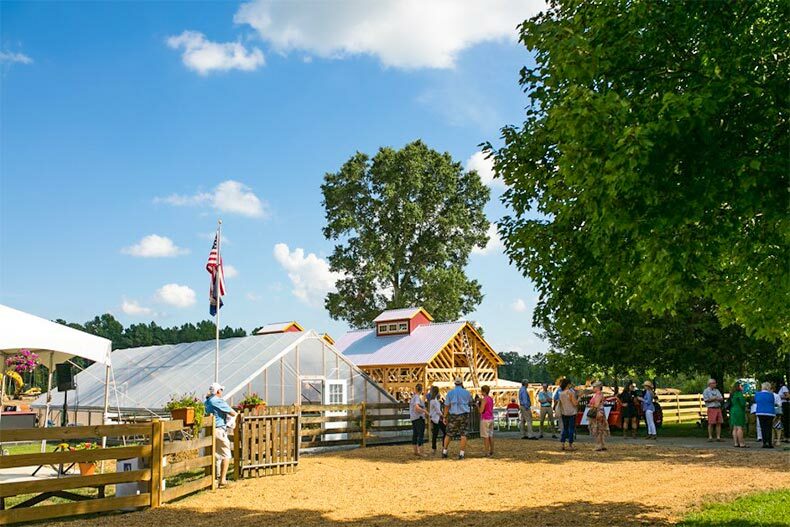 In support with its main attraction, Woodside Farms, the community will also include a farmhouse, a farmers market, event space, and areas for large community dinners. Although the farm will be professionally managed, residents can enjoy smaller gardens throughout the community. Chickahominy Falls is 25 minutes from downtown Richmond, where residents can enjoy all the features of a big city, including Virginia Museum of Fine Arts, Science Museum of Virginia, Richmond Flying Squirrels and the Virginia Commonwealth Union’s baseball teams. The Virginia Commonwealth University’s Medical Center is only a 25-minute drive away and the Richmond International Airport, 25-minutes away by car.